President Adams, Speaker Wilson, members of the Legislature, justices of the Supreme Court, Utah’s First Lady, Lieutenant Governor and Mrs. Cox, other constitutional officers, and my fellow Utahns: It is an honor to address you tonight. President Adams and Speaker Wilson, congratulations for being elected to your significant leadership roles. I have appreciated working with you to prepare for this session and I look forward to continued collaboration as we address this year’s challenges. I extend a special welcome to the 19 new representatives and the 7 new senators here this evening. I thank you for stepping into the political arena to serve the citizens of the great state of Utah. Our separation of constitutional powers can, from time-to-time, create some tensions. And given current national trends, can I tell you just how grateful I am that the Speaker didn’t disinvite me from delivering this year’s State of the State? Because of your kindness, I promise I won’t cancel your state-sponsored travel to the Six County Summer Meetings in Nephi. A few of you might recall some of what I said at last year’s State of the State. My hope at the time was that my eloquent oratory about Utah’s unique spirit of collaboration would capture your hearts and your minds. But no. All that anyone seems to remember about last year’s State of the State is that I gave that speech with two painful kidney stones. As it turns out, that was not true. Nothing actually “passed.” So, the other memory folks have of that episode is that I underwent surgery and while suffering under the knife, Lieutenant Governor Spencer Cox had a heyday exercising gubernatorial powers with reckless abandon for a grand total of two hours. But the state survived. And, to Spencer’s lament, so did I. On a more serious note, as I reflect on the state of our state, this past year came with more than its fair share of challenges. The polarization and dysfunction in Washington DC have had a direct material impact on our state. Drought has created punishing conditions for wildlife and agriculture. Fires have devastated our forests, fouled our watersheds and polluted our air. But Utahns have faced these challenges as they have always done, with faith, courage and resilience. And overall, 2018 was indeed a banner year of accelerated economic growth and prosperity. So I am pleased to report to you tonight that in spite of challenges, the state of our state is strong, it is resilient, and our outlook is very bright. Provo Police Officer Joseph Shinners. Tonight, we are honored to have members of their families with us in the gallery — living witnesses that our security and our freedoms come at great cost. We cannot begin to comprehend your loss. We stand together tonight to honor the ultimate sacrifice you have made as families to serve us and to protect us. When I first took office, Utah’s economy was reeling with foreclosures and crippling unemployment. I said at that time that through unprecedented partnerships we could achieve unlimited possibilities. So we set our sights high on becoming the top performing economy in America. And just look how far we have come! With positive job growth in every sector, Utah is now the healthiest and most diverse economy in the nation today. Because of the attraction of our strong economy, our biggest challenge now is growth, that if we don’t accommodate, will have a negative impact on our quality of life. Growth is the groundswell of our prosperity, but it puts pressure on education and how we provide the healthiest, safest, and smartest schools in America; it also makes it difficult for Utah families to find affordable housing; and it increases congestion on our roads.Growth makes it more challenging to protect the open spaces that provide the backdrop for our unique quality of life; it threatens the quality of our air and water and thereby our health. I can only address a few of these complex challenges tonight, but they are all worthy of our best deliberations over the next 42 days. And as we welcome some two dozen new faces to the legislature, we look forward to your new ideas and perspectives on these and other issues. And to our new colleagues, let me share what I believe is some sage advice: Learn everything you can about the state budget. Your solutions to our challenges of growth will be limited if we don’t have sustainable revenue to support good policy. The more you know about the budget, the more effective you will be as a legislator because how we collect revenue and how we spend it is at the core of policy-making. And this session we have the enviable task of deciding how to invest over a billion dollar surplus. This surplus is not here by accident. It has come from the hard work of the millions of Utahns whom we serve. It has come because of the decisions of past legislators and governors to spend taxpayer dollars prudently and manage them wisely. Let’s not assume that this surplus is the new normal. Some of the surplus may be attributed to one-time events, like adjustments made to the new federal tax law. And with this surplus let’s pay down some debt and invest in efforts that will pay future dividends. Let’s prioritize the surplus toward our biggest challenges. 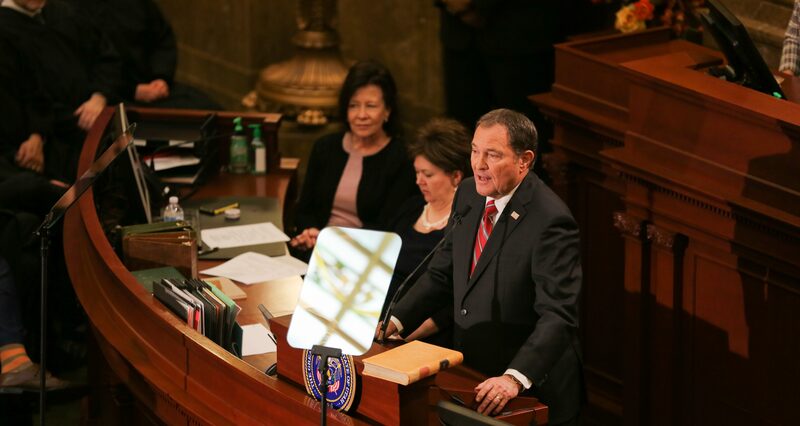 And finally, I agree with Speaker Wilson that we should invest directly in the hardworking Utahns who created this surplus by giving them a $225 million tax cut, which will be the largest tax cut in Utah’s history. You know how much I like to talk about Utah’s disciplined fiscal leadership. But our fiscal leadership and budget management face some hurdles. For instance, the much needed Medicaid expansion passed by the voters needs to be implemented in a fiscally sustainable way. And with some common-sense adjustments, I know that we can implement this program without delay. A major structural budget challenge is Utah’s narrowing tax base. If we do not modernize Utah’s tax code, I fear that we will not have the capacity to address our growth-related challenges, and that our economy will begin to underperform and that inequities will continue to grow. Developing a more equitable, simple and sustainable tax system will be our number one priority this session. Let me elaborate. The General Fund that pays for the core governmental functions that benefit everyone — such as public safety, courts, corrections, transportation, social services and Medicaid — is generated from a sales tax that captures a narrowing base of the state’s economic activity. For example, we still tax the sale of buggy whips (even though they don’t generate much revenue). Meanwhile, an Uber or Lyft ride is tax exempt. Indeed, Utah has seen the nation’s second largest decline in taxable sales as a portion of consumer spending. In 1980, 70 percent of the economy was part of the general fund tax base. Today, it’s only 40 percent, and that number continues to shrink. Here’s an analogy: If the sales tax base of statewide economic activity were represented by a group of 10 friends who meet at a restaurant for dinner, when the bill came in 1980, 7 of the 10 helped picked up the tab. But today, when the bill comes only 4 pay for it and 6 of them walk away without paying a dime. Common sense tells us that this is patently unfair. And if these trends continue, it is absolutely unsustainable. Good tax policy requires broadening the base so that everyone pays their fair share and good tax policy also requires lowering the rate so that everyone pays less. As we take on this task, working with leadership, Senator Fillmore and Representatives Spendlove and Quinn, the principles of fairness, simplicity, sustainability and common sense should guide our decisions. All the goods and services that make up our modern economy, all the goods and services that benefit from our business-friendly, well-managed state, should contribute to our tax base. That is the definition of broadening the base. And as we broaden the tax base, we will slash the state sales tax rate. We will cut it by 64 percent from 4.85 percent to a mere 1.75 percent. That is a tax cut of $225 million, especially benefitting lower and middle income families. This would mean that nearly nine out of ten taxpayers will pay less sales tax tomorrow than they pay today. Now let’s talk for a moment about education, our number one budget priority. We have developed an educational road map that is doing for education what we did for economic development: steadily moving us towards becoming the nation’s top education system. We now graduate 87 percent of high school students, which is up 11 percentage points since I came into office. And more students now graduate from high school with college credits. This, coupled with the third lowest college tuition in the nation, contributes to why Utah has the lowest average college student debt. I believe, and the people of Utah believe, and I know that you also believe that there is no better investment that we can make than in our Utah students. That’s why we set an ambitious five-year goal to invest an additional $1 billion in new ongoing revenue into public education, and $275 million in new ongoing revenue into post-secondary education by the year 2021. Because of your work and a growing economy, we will complete that investment one full year ahead of schedule. And with these additional funds, we can do some great things. In public education, for instance, we can do more than just cover the growth in new students. We can fund a 4 percent increase in the Weighted Pupil Unit — the main source of funding for public education. We can better help students who are at risk of academic failure and keep our schools healthy and safe by investing $30 million into much needed counseling and mental health services. We can also put over $100 million into upgrading facilities, two-thirds of which should go in to school safety improvements. In higher education, we can improve accessibility by endowing $50 million of one-time money to a scholarship fund for financially disadvantaged college students. And working with our college presidents and our Board of Regents, we will continue to increase student completion rates and decrease the time needed for graduation. As our students graduate they need the knowledge and skills necessary to prosper in a competitive global marketplace. So, I would like to see robust computer science courses offered to every middle school student in Utah. I would also like every student to have a better understanding of basic free market economics. When I meet with students, I am impressed by their intelligence and curiosity. But frankly, I have been disturbed by some of the rising generation’s fascination with socialism. What we see in Venezuela should remind us that tyranny and poverty follow economic systems where the state controls production, where bureaucrats allocate resources and where government picks the winners and the losers. That is why I support Representative Jefferson Moss’s bill to strengthen the curriculum in our required financial literacy course to include instruction on the core economic principles that have given us our freedom and our prosperity. It is imperative that Utah high school graduates understand not only their civic responsibility and the principles of our nation’s founding and constitution, but also the basic economic principles of free-market capitalism that have made America great. And, let’s not forget the importance of parental involvement in learning. As we have recognized in statute, parents have the primary role in their children’s education and our policies should always foster that involvement. One of the most complex challenges as a result of our growth is our air quality. I appreciate the ongoing efforts to help clear the air by legislators like Patrice Arent, Joel Briscoe, Steve Handy, Eric Hutchings and Todd Weiler. We know that a lot of little things, like reducing cold starts, can add up to big improvements. But we can think bigger. That is why we have set a goal of reducing by 25 percent our per capita emissions across the state by 2026. And that is why we need to make a down payment of $100 million for data-driven improvements in our air quality. The state itself is one of Utah’s largest employers. So let us lead by example. Because tailpipe emissions are such a big part of the problem, let’s reduce the miles driven by state employees by increasing state employee use of transit and accountable telework. Let’s eliminate the dirtiest state vehicles and replace them with Tier 3 and electric automobiles. Let’s improve the energy efficiency of State buildings by using a revolving fund that replenishes itself through efficiencies gained. And let’s make electric vehicle charging stations more accessible and convenient statewide by providing 300 electric vehicle chargers for public use at state facilities and providing incentives for an additional 800 charging stations at private businesses. That would be more than a five-fold increase in the number of chargers available today! Our Division of Air Quality estimates that these actions taken together — many of which I hope will also be adopted by other employers — will reduce dangerous pollutants in our atmosphere by a total of 14,000 tons. That’s like taking more than 65,000 automobiles off the road annually, or the equivalent of all the registered automobiles in my home town of Orem. And speaking of transportation, May 10th of this year marks 150 years since the completion of the nation’s first transcontinental railroad at Promontory Summit. It’s hard to overstate the importance of that accomplishment for unifying a nation that had been fragmented by civil war and divided by geography. It made us the crossroads of the west, opening up Utah’s abundant resources to national and international commerce. As the railroads came close to completion, Charles Crocker of the Central Pacific Railroad, bet Thomas Durant of the Union Pacific Railroad $10,000 that his workers could lay more track in one day than Durant’s. Durant’s Union Pacific crews had already set the record by laying six miles of track in a single day. On April 28, 1869, Durant — sure of his bet — came over to watch Crocker lose the wager. The choreography of getting ties, rails and spikes into the right place at the right time so that workers could fasten them securely, mile after mile, was the precursor to the modern assembly line. To win the bet, workers had to lay down over 25,000 railroad ties, over 3,500 rails, and drive more than 55,000 spikes. Working from sunup to sundown, Central Pacific workers laid down over ten miles of track in one day — and that’s a record that still stands to this very day. What an accomplishment! What an amazing example of teamwork! Crocker won the money. But we know that the reason he won was because of the backbreaking labor of the thousands of workers who, day-by-day, mile-by-mile, had perfected their skills and sped up construction. The Central Pacific noted the names of eight Irish workers who were there that day. But, unfortunately, no one recorded the names of the thousands of Chinese workers’ whose labor was essential to the success of this herculean effort. Although their individual names have been forgotten, their singular contribution is unforgettable. So consider this: the people who literally reunited our nation following the Civil War were the nation’s outcasts — freed slaves, Irish immigrants, exiled Mormons and underpaid Chinese workers, among others. As we celebrate the 150th anniversary of the driving of the Golden Spike, here are some lessons I hope that we take into account as we start another challenging legislative session. First, we can and we should do more to protect the nameless, the outcast and the vulnerable. Second, even in times of deep division and discord, even when some naysayers are betting against us, great things can be envisioned and can be accomplished. And finally, although we come from diverse backgrounds and experience, we can work side-by-side, sunup-to-sundown, with the spirit of cooperation to lay a foundation for our future prosperity. So let this be the year that we make a major down payment toward continued improvements in air quality. Let this be the year we invest to make our schools safer and healthier even as they continue to climb to the summit of educational excellence. And let this be the year that we stand together to create a fairer, a simpler and a more sustainable tax code, by broadening the base, cutting the rates and giving low and middle income families the biggest tax cut in Utah’s history. After all, that is the Utah Way. God bless us in this effort, and God bless the Great State of Utah.